The mainstream media has been less than enthusiastic about uncovering the root of the investigation into the Trump campaign and the Trump transition team. However, in spite of their efforts to bury the misdeeds of people in the Obama administration, the story is slowly beginning to come out. Most of the mainstream media is still avoiding telling the story, but you can still find it in some outlets. Yesterday The New York Post posted an article by Andrew McCarthy that reminds us of some of the unseemly (and probably illegal) things that were going on in late 2015 through early 2017. I strongly suggest that you follow the link to read the entire article, but there are a few things that need to be highlighted. This memo is evidence that President Obama was at least aware of what was going on. That should be all over the front pages of every newspaper in the country. Somehow it isn’t. Who Gets To Be Represented In Congress? One America News Network reported yesterday that the Supreme Court will take up the matter of the citizenship question on the 2020 Census. The Trump Administration is looking to appeal a ruling by the Southern District of New York, which struck down their request. The ruling then headed to the Second Circuit Court of Appeals; however, this latest move means Justices will resolve the case before the lower court has the chance to review it. The Department of Justice said Commerce Secretary Wilbur Ross, who announced he would pursue updating the questionnaire in 2018, has the legal authority to include the citizenship question on next year’s census. However, the district judge cast doubt on the reasoning behind Ross’ decision to include the question in the survey. The judge argued its inclusion would be unlawful and would violate the Administrative Procedure Act, but Ross cited the need to enforce the Voting Rights Act by asking census-takers if they are citizens of the United States. The agency argued the question was included in previous years, with it last being seen in 1950. Why is this important? It’s important for the House of Representatives and for the Electoral College. Because Congress is reapportioned in accordance with overall population, states with large undocumented populations that would go uncounted stand to lose representation. Due to the growth of the immigrant population in the southeast in recent years, in both rural towns and large southern cities like Atlanta and Charlotte, the impact of a census undercount will be felt in blue and red areas alike. As one expert has noted, the states “most disadvantaged, however, are not those with simply the most undocumented people,” like New York or Illinois. Rather, the states with the highest proportion of undocumented people compared to overall population would be the most impacted. These states include solid blue states like California, Maryland and New Jersey, but also a number of red states and swing states – Arizona, Florida, Nevada, and Texas. To the extent the citizenship question drives down the response rate, these states are most likely to lose congressional representation. The number of votes a state receives in the Electoral College is also partially determined by the number of Representatives the state has in Congress, so an accurate count of the population is also important in determining the number of electors. Putting the citizenship question on the 2020 Census will allow a more realistic count of American citizens. American citizens are the people Congress is supposed to represent. You gain the right to vote and to be represented when you become a citizen. Otherwise, you are simply a guest. Would you let a guest (invited or uninvited) determine the rules and budget of your household? The Daily Caller is reporting the following today: “Late-Night Deal Breaks Deadlock Over Natural Gas Exports. The Trump Administration Is Ecstatic.” Natural gas is one of the cleanest energy sources in the world. America has a lot of it. Exporting it will have financial and diplomatic rewards. The Federal Energy Regulatory Commission (FERC) broke a two-year partisan deadlock Thursday night to approve a liquefied natural gas (LNG) export terminal in Louisiana. Top Department of Energy (DOE) officials said this was a major breakthrough that will alleviate a growing problem for U.S. energy producers — a lack of export infrastructure. “We have been promoting US energy around the world and today’s decision by the FERC is a very important one,” DOE Deputy Secretary Dan Brouillette told The Daily Caller News Foundation in an interview. The Calcasieu Pass LNG export terminal is the first such project to get FERC approval in two years. Republican FERC commissioners Neil Chatterjee, the chairman, and Bernard McNamee worked with Democrat Cheryl LaFleur to hash out an agreement to get her support. The commission’s environmental review of Calcasieu Pass found the facility would emit roughly 3.9 million metric tons of carbon dioxide emissions per year — about 0.07 percent of total U.S. emissions. Brouillette argued that while an individual LNG export terminal would emit greenhouse gases, it would help lower global emissions because countries want gas as an alternative to coal. “To the extent that LNG is displacing coal around the world, we think the impact is going to be positive,” Brouillette said. Brouillette also stressed the geopolitical implications of LNG exports and the role energy could play in President Donald Trump’s foreign policy. Energy independence for America is important, but it is also important to be able to export energy around the world when countries such as Russia threaten to shut down their energy pipelines in order the win political victories. Andrew McCarthy posted an article at National Review yesterday about Hoda Muthana, currently detained in a refugee camp in Syria, who wants to come home to America. This conclusion is disputed by Muthana’s family and allies, and they may have a case. I would strongly urge the Justice Department to file an indictment against Muthana for treason, material support to terrorism, and any other readily provable offenses. She is less likely to press the issues of citizenship and right to enter if she understands that she faces prosecution and, very likely, lengthy imprisonment if she succeeds in coming here. But it’s worth taking a closer look at the citizenship question itself. To my mind, the concept of citizenship implies not just the benefits of being a full-fledged member of the body politic, but also a duty of fealty to the nation. In a rational world, then, a citizen who made war against the United States would be stripped of citizenship. Ms. Muthana left America to join ISIS, a group that was (and is) at war with America. If she claims to be a citizen, she should be charged with treason. Again: If the president and the secretary do not want Muthana to try to come back to the United States, the best strategy is to have the Justice Department indict her on serious felony charges. She may seek another alternative if she knows the risk of coming back here is decades of imprisonment. Of course, Muthana may decide to come anyway. After all, (a) she might see life in an American prison as better than her other alternatives, and (b) if she is an American citizen, there is a good argument that her young son is a citizen, too — he’d have a more promising chance of survival and a decent life here than in Syria (or wherever else in that godforsaken region they could end up). In any event, the State Department has made its decision. Now it is up to Muthana’s supporters to establish her citizenship if they can, and for the Trump administration to indict her if it chooses. Yesterday Ed Morrissey posted an article at Hot Air about the spending bill the President signed this morning. Forty-eight hours before the government would have shut down, Congress produced the conference report containing the seven remaining funding bills for the FY2019 budget. And less than 20 hours after producing the 1,159-page monstrosity, both the House and the Senate are expected to pass the bill. Perhaps members will take a nap with it under their pillow to absorb it by osmosis. It’s not a good bill, and even if it were, how would anyone know? I am sure some members of Congress assigned various sections of the bill to staff members in the hopes of getting most of it read, but this is no way to run a country. Meanwhile, the President is charged with defending our borders. We have had and continue to have thousands of people forming caravans to break into our country. Any public official who took an oath to defend our Constitution has an obligation to defend our borders. I really don’t understand why that is so difficult to understand. Well, yes I do–it’s about money and voters. When the Democrats look at illegal aliens, they see Democrat voters. Illegal aliens are already allowed to vote in local elections in some cities and states. When Republicans look at illegal aliens, they see cheap labor. Since much of the campaign money for Republicans comes from PAC’s related to the U.S. Chamber of Commerce (made up of corporations that support cheap labor), Republicans are not inclined to seal our borders. A recent report by the Migration Policy Institute, entitled Chilling Effects: The Expected Public Charge Rule and Its Impact on Legal Immigrant Families’ Public Benefits Use, revealed that 10.3 million out of the 22 million foreign nationals in the U.S. receive benefits from at least one welfare program funded by taxpayer dollars. Additionally, 54.2% of foreign national children, age 17 and younger, are granted welfare benefits. The data also showed that 46.3% of foreign national welfare recipients are adults, age 18 to 54, and 47.8% are older than 54. MPI examined a leaked draft of an executive order that would deny green cards to individuals who use public benefits, or have relatives who do. The report goes on to explain how the Trump Administration’s Public Charge Rule would reduce the number of foreign nationals on welfare, cause a decrease in immigration levels, and make it more difficult for foreign nationals and their dependents to be eligible for welfare benefits. A website called nokidhungry.org reports that 17.9 percent of American children under the age of 18 are living in households that experienced limited or uncertain availability of safe, nutritious food at some point during the year. (Source: Feeding America). That number is a disgrace when you consider the amount of money we provide to poor families in this country, but it also illustrates the fact that we cannot afford to support more low-income families–particularly if they are not American citizens. It is pathetic that Congress could not support preserving our country. Thank God we have a President who is willing to fight to preserve America. NBC News posted an article today about the relationship between President Trump and the nation of Turkey. As Trump administration officials presided over the second day of an international conference in Warsaw dominated by calls to ratchet up pressure on Iran, one longtime U.S. ally and NATO member was noticeably absent — Turkey. Snubbing the gathering in Poland, Turkish President Recep Tayyip Erdogan on Thursday attended a rival conference in the Black Sea resort of Sochi, where he planned to meet his Russian and Iranian counterparts to work out a final settlement of the war in Syria. The dueling summits illustrate President Donald Trump’s struggle to forge a united front against Iran, and reflect Turkey’s drift away from Washington as it finds common ground with Moscow and Tehran, experts and former officials said. These three paragraphs are totally misleading and paint a negative picture of President Trump’ foreign policy that is totally inaccurate. Recep Tayyip Erdoğan became President of Turkey in 2014. He had previously served as Prime Minister from 2003 to 2014. As he moves Turkey in the direction of an Islamic State, it is only natural that his friendly relationship with America would deteriorate rapidly. Harold Rhode, a senior fellow at the New-York-based Gatestone Institute and a former adviser on Islamic affairs in the office of the American secretary of defense, told The Jerusalem Post in an interview on Sunday that the real issue in the ongoing conflict is that Turkey and Qatar are supporting the Muslim Brotherhood and Hamas in their goals. “[Turkish Prime Minister Recep Tayyip] Erdogan has been associated with the Muslim Brotherhood long before he was prime minister,” Rhode said. It should now be clear to all that Erdogan “is now out of the bag,” Rhode said, adding that US President Barack Obama does not speak to the Turkish leader anymore despite previously describing him as one of his closest friends among the world’s leaders. “Erdogan is doing whatever he can to help Hamas,” he said, asserting that it will only hurt the Palestinian people in the end. As National Security Advisor John Bolton heads to Turkey today for discussions about President Trump’s announced decision to withdraw U.S. troops from Syrian battle spaces, he might question Turkish President Recep Tayyip Erdogan about his expressed intent to re-establish the Ottoman Empire and how Erdogan calculates U.S. policy in the region to figure into that ambition. He might cite from Erdogan’s February 2018 assertion that “modern Turkey is a ‘continuation’ of the Ottoman Empire,” or ask exactly what Erdogan meant when, in November 2018 he declared that “Turkey is bigger than Turkey; just know this. We cannot be trapped inside 780,000 kilometers [Turkey’s total area].” He might perhaps ask also what exactly Erdogan meant by threatening the U.S. with an “Ottoman Slap,” in reference to American support for Kurdish forces fighting against the Islamic State. Then there was the November 2018 “International Islamic Union Congress,” held in Istanbul. Headed by Erdogan’s chief military advisor, Adnan Tanriverdi, the event’s participants endorsed the aim of “unity of Islam” through establishing the “Confederation of Islamic Countries.” It was not entirely clear how or if such a “Confederation” would differ from a Caliphate or Islamic State. Clearly, U.S. objectives for the region are not the same as Turkey’s. I don’t think President Trump is the problem in our relationship with Turkey. The Washington Free Beacon posted an article today about the impact of regulations on business franchises put in place during the Obama administration. An industry study found that the Obama administration’s crackdown on franchising has cut hundreds of thousands of job openings and dealt a $33.3 billion blow to the economy each year dating back to 2015. A report put out by the International Franchise Association and a Chamber of Commerce found that the Obama administration provoked an “existential threat” to the franchise model in which small business owners operate under the umbrella of a national corporate brand. The Obama administration departed from decades of precedent when the National Labor Relations Board held that parent companies could be held liable for labor violations committed by franchisees. The report estimated that the new joint employer standard set curtailed expansion in the industry, leading to between 142,000 and 376,000 lost job opportunities—a 2.55 to 5 percent reduction in the workforce. The Trump NLRB has turned to rulemaking to solidify the previous joint employer standard, which only held parent companies liable if they were directly involved in a violation. A previous decision overturning the Obama agency ruling was dismissed after an ethics official said Trump appointee William Emanuel should have recused himself because his old law firm handled joint employer cases. Bird and Haller said the effects of the regulation would not immediately reverse the damage caused by four years of uncertainty, but would be a first step to helping the industry begin creating new job opportunities and expand existing hiring. “There is the opportunity to this [Trump NLRB] regulation to remove much of that source of fear and to remove the uncertainty—that is the minimum first step to recovering and removing these costs,” Bird said. The report featured 77 one-hour interviews with lawyers, franchisees, and franchisors of all different sizes across the country. IFA has submitted the report to the NLRB as part of the public comment period for the rule proposal. The agency will begin reviewing these comments and all replies by Feb. 11. Hopefully the ruling make during the Obama administration can be overturned and more people can go back to starting franchise businesses. It’s hard to defend the actions of the Federal Reserve right now. The people who propped up the economy under President Obama seem determined to destroy the economy under President Trump. But we know that the Federal Reserve is apolitical. Sure we do. However, there may be some unintended consequences of the current Federal Reserve actions. The Gateway Pundit posted an article today which explains some of those consequences. The Chinese were relentless in their efforts to obtain Western technology and grow their economy. They set up trade barriers and manipulated their currency in ways that helped China. The US was at a disadvantage in trade resulting in massive deficits into the billions. Along comes the Trump Administration, the first administration to address China’s unfair trade advantage. President Trump is a shrewd negotiator and he obviously believes now is the time to encourage China to make changes to their trade barriers with the US. China may have no choice but to go with what the US offers to keep its economy afloat. The more pressing issues for China surround real estate, in a manner similar to the US in 2008. As China grew, it invested in its infrastructure and in addition it invested in large housing projects throughout the country. These efforts helped bolster China’s already fast growing economy. The problem is that China over invested in these random properties all over China and these properties today remain empty. …Now to add to China’s misery, the Fed is doing all it can to kill the US economy. China is dependent on the US economy to stay afloat. …The US debt now stands at $21.8 trillion. A 2.25% interest increase on this amount of debt is an annual increase in debt interest payments of $500 billion!!! The Fed is doing all it can to destroy President Trump’s economy. What the Fed doesn’t realize is that a flat US economy means disaster to the Chinese. China’s financial crash may make the 2008 crash in the US look small. The implications will no doubt impact the entire world. Jerome Powell at the Fed has no idea what he is doing! Hang on to your hat, if the Federal Reserve continues on its current path, this may be a very bumpy ride. Who is James Wolfe, and why does it matter? On Thursday, American Greatness posted an article about James Wolfe, a former staff employee of the Senate Select Committee on Intelligence (SSCI). Late Thursday, a federal judge sentenced Wolfe to two months in jail for one count of lying to the FBI; the prosecution had asked for 24 months. After a tearful apology to the judge, Wolfe essentially escaped with a slap on the wrist. Outrageous. Wolfe, 58, was a key player in the leaking strategy employed by anti-Trump bureaucrats to seed bogus Trump-Russia collusion stories in the news media during the administration’s early months. Entrusted with safekeeping the committee’s most secret documents, Wolfe was caught passing off the information to four reporters. One of the journalists, Ali Watkins, was at least 30 years his junior; their three-year affair began when she was a college intern working for a Washington, D.C. news organization. The first lesson here is don’t let your daughters be interns in Washington–there are a lot of older men walking around with evil intentions. The second lesson is more serious. James Wolfe was leaking classified information to newspapers with the intention of discrediting the Trump administration. He then lied about his actions when caught. He is looking at two months in jail. General Flynn has agreed to a plea of lying to investigators. He has lost his house, been financially ruined, etc. I realize that there is probably much more to that case than the public is aware of, but it seems to me that General Flynn’s actual crime was agreeing to be part of the Trump administration. His treatment by those in the ‘deep state’ was meant to send a message to anyone who was willing to be part of the Trump administration. The Mafia has been known to use similar tactics. Sounds a little bit more consequential than a phone conversation about Russian sanctions, right? But here is the real injustice: While it was clear by both the original indictment and the sentencing memo that Wolfe was responsible for disclosing details about the FISA warrant on Trump campaign aide Carter Page, he was not charged with that crime—a felony punishable by up to 10 years in prison. The investigation into Wolfe began after the Washington Post published an explosive story in April 2017 confirming that the FBI had obtained a FISA order right before the election to spy on Page. James Wolfe belongs in prison for much longer than two months. Until we have equal justice under the law, we will not have our republic. The press is supposed to be holding elected officials and other bureaucrats accountable–not putting their thumb on the scales of justice. 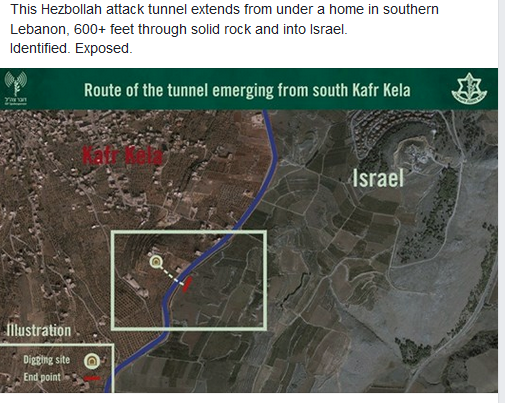 The Washington Post posted an article today about the Israeli effort to destroy these tunnels. Israel on Tuesday began to destroy Hezbollah tunnels dug under its northern border, an operation launched with much fanfare at a time when embattled Prime Minister Benjamin Netanyahu faces a corruption investigation and accusations of being soft on security. The military said it had exposed one of the Lebanese militant group’s tunnels that crossed into Israeli territory in what it dubbed “Operation Northern Shield.” A military spokesman, Lt. Col. Jonathan Conricus, said that “several” tunnels had been monitored for “quite a long period of time” and that the operation had been planned for a year and a half. …Iran’s regional hegemony has also been a driving foreign policy concern of the Trump administration. U.S. national security adviser John Bolton said the United States “strongly supports” Israel’s efforts to stop tunneling into its territory. “More broadly, we call on Iran and all of its agents to stop their regional aggression and provocation, which pose an unacceptable threat to Israeli and regional security,” Bolton said. Israel has been using what it says is new technology to detect and destroy tunnels built by Hamas in the south, under the fence with Gaza. However, the tunnel destroyed on Tuesday was the first on the northern border. These tunnels are another reason why sanctions on Iran are a good idea. Hezbollah is funded by Iran. The Washington Free Beacon is reporting today that the U. S. has confirmed that Iran has successfully fired a nuclear-capable missile. Great. The administration is hoping to convince European allies to move forward with new sanctions as reprisal for the missile tests, a position many of these allies are hesitant to adopt. As Washington, D.C., moves forward with a bevy of new sanctions on Iran, some European allies have continued to balk the U.S. administration, seeking avenues to preserve the nuclear pact and ensure economic ties with Tehran remain open. “We would like to see the European Union move sanctions that target Iran’s missile program,” Hook told reporters. “Just a few days ago, we unveiled new evidence of Iran’s missile proliferation,” Hook explained. “Three days later, they test launched another medium range ballistic missile”. What the Trump administration is not considering here is that Europe is economically dependent on trade with Iran. Until European leaders see Iranian missiles actually heading in their direction, they will not be willing to put any sort of sanctions on Iran. It needs to be done, but our European allies (?) are not willing to pay the necessary price. The information below was taken from an article at The Gateway Pundit posted yesterday. 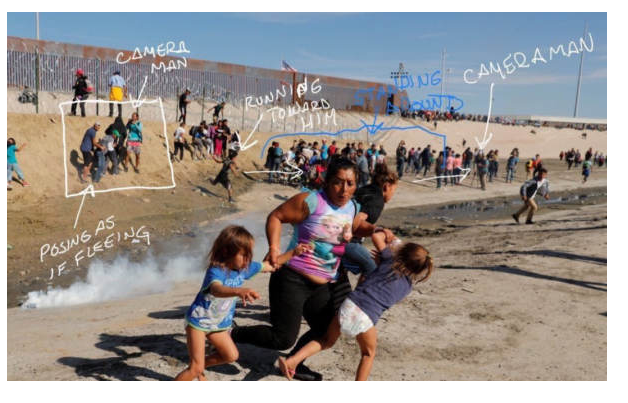 Have you seen this picture on the news lately? There is an attempt by the mainstream media to manipulate Americans into believing things that are simply not true. What their motive is I do not know. However, I wonder if they understand that the socialist paradise they think they want to usher in will eventually lead to economic conditions similar to Venezuela or Cuba and that they will be forced to live under those conditions. 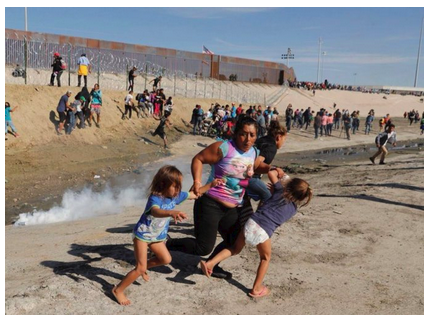 The media needed their dramatic photo with women and children and they got it. Rodney Scott, the Chief Patrol Agent in San Diego said people were purposely pushing the women and children to the front before they started throwing projectiles at law enforcement, ultimately causing the situation to escalate. It is sad that our media has lost its way. A District Court does not have authority over the President. However, that doesn’t stop some judges from trying to exercise that authority. Part of the President’s job is to defend the country. The courts do not have the right to interfere with that defense. However, one court is doing just that. The Conservative Treehouse is reporting today that U.S. District Judge Jon Steven Tigar in San Francisco has issued a temporary restraining order against the Trump administration’s modified emergency asylum policy which barred asylum for aliens who enter the country illegally. Note that the President’s modified policy only applies to those who enter the country illegally. Since when did people breaking the law to come here have rights? While a challenge was predictable, frustrating and likely to be spun up by media, the ruling only applies to aliens who gain illegal entry and request asylum. Nothing in the ruling stops the hardened border enforcement and/or current expedited review and deportation program. In essence, keep the illegal aliens out and the judicial ruling is moot (until defeated in higher courts). Though it might frustrate the left-wing media and the open borders crowd, no court can successfully demand the President of the United States to stop border enforcement. This is why it is critical to have a strong DHS Secretary focused on stopping illegal entry. This ruling will obviously be appealed by the DOJ; and politically the Democrats realize, in the bigger picture, this ‘open-border’ narrative is not good for them. On its face this ruling is ridiculous as it eliminates/undermines the legal process for asylum requests by removing the distinction of illegal or unlawful conduct in the application process. I am sorry that conditions in the home countries of the migrants are so awful, but why don’t the young men in the caravan stay behind and attempt to change things? I am reminded that many Americans lost their lives in the Eighteenth Century fighting for the freedom of America. Where is that spirit among the migrants in the caravan? Do they love their homeland enough to fight for it? During the final weeks of the mid-term election campaign, you will hear Democrats say, “The tax cuts were only for the rich–they didn’t help anyone else.” A misinformed friend of mine posted that on Facebook recently. So let’s look at the facts. The Conservative Treehouse posted an article yesterday about the impact of the Trump Tax Cuts on average Americans. Walgreens Boots Alliance announced that it will make investments around $150 million to boost mainly its in-store wages in fiscal 2019 in the light of favorable tax reforms. …The pharmacy-chain owner Walgreens Boots Alliance announced Thursday that it will make investments of about $150 million to boost mainly its in-store wages in fiscal 2019 in wake of President Donald Trump’s tax reforms. The announcement marks a 50% increase in company’s investment towards wages which was announced in March. At the time, Walgreens said it would invest around $100 million per annum to increase wages beginning later this calendar year. “We will be making select incremental investments of around $150 million in fiscal 2019, mainly in store wages, but also to fuel our new community health care initiatives, and you can view these in light of the favorable tax reforms in the US,” Walgreens CFO James Kehoe said Thursday, on the company’s fourth-quarter earnings call. In December 2017, the Trump administration slashed the federal corporate tax rate from 35% to 21% and allowed a one-time repatriation of overseas cash. The bill also allows companies to bring overseas profits back home to invest in domestic projects or repurchase of shares. Kehoe said the investments will result in a headwind of approximately $0.12 a share, or two percentage points of earnings-per-share growth for the coming fiscal year. US retailers are scrambling to keep workers as they look for opportunities with higher pay and attractive benefits. The US unemployment rate fell to a 48-year low of 3.7% in September. According to the Bureau of Labour statistics, there were 757,000 retail-job openings across the United States in July, which is about 100,000 more than a year ago. The surge in the number of retail jobs has allowed workers the opportunity to move around within the industry. As a result, companies are raising wages to try and retain workers. Earlier this month, Amazon hiked its minimum wage to $15 per hour, effective November 1. That followed wage hikes from places like Target and Costco. Back in January 2017 Deutsche Bank began thinking about it, applying new models, trying to conceptualize and quantify MAGAnomics, and trying to walk out the potential ramifications. They began talking about Trump doubling the U.S. GDP growth rate when all U.S. investment groups couldn’t yet fathom the possibility. It’s like waking up on Christmas morning every day to see the pontificating Fed struggling to quantify analysis of their surrounding reality based on flawed assumptions. They simply have no understanding of what happens within the new dimension. Monetary policy, Fed control over the economy, is disconnected and will stay that way for approximately another 12-14 months, until Main Street regains full operational strength –and– economic parity is achieved. As we have continued to share, CTH believes the paycheck-to-paycheck working middle-class are going to see a considerable rise in wages and standard of living. How high can wages rise?… that depends on the pressure; and right now the pressure is massive. I’m not going to dismiss the possibility we could see double digit increases in year-over-year wage growth in multiple economic sectors in several regions of the U.S. Remember, as wages and benefits increase – millions of people are coming back into the labor market to take advantage of the income opportunities. The statistics on the invisible workforce varies, but there are millions of people taking on new jobs in this economy and the participation rate is growing. The Washington Post reported yesterday that Pastor Andrew Brunson was released yesterday after a Turkish court convicted him of aiding terrorism but sentenced him only to time served. He was flown out of Turkey to Germany last night. Ambassador Grenell offered Pastor Brunson an American flag. Brunson immediately took the flag and kissed it. U.S. officials said Thursday that the two governments had negotiated an agreement that would see Brunson released in exchange for the lifting of U.S. sanctions on two senior Turkish cabinet ministers — penalties imposed to gain leverage in the Brunson case. The deal was reached on the sidelines of the U.N. General Assembly last month, the officials said. In recent months, the Trump administration had made the pastor’s release a priority. Vice President Pence took a particular interest, helping mobilize Trump’s evangelical political base in support of the cause. Brunson’s release also came as Turkey was investigating the disappearance of Jamal Khashoggi, a Saudi journalist who Turkish investigators believe was killed after he entered the Saudi Consulate in Istanbul last week. Turkey has briefed U.S. officials on the investigation and is seeking the Trump administration’s support in pressing Saudi Arabia to provide information about Khashoggi’s fate. At the same time, Turkey is trying to avoid a total rupture in relations with the Saudis, analysts said. In recent years President Recep Tayyip Erdogan has been taking steps to move Turkey toward a Muslim caliphate (with dreams of reestablishing a caliphate that encompasses much of the Middle East with Erdogan as the caliph). Turkey has also moved closer to Russia during that time and away from its previous friendly relationship with Israel. There are currently some real questions about whether or not Turkey should remain a member of NATO. CNS News is reporting today that not only is the economy booming, the federal government has cut 16,000 jobs during the Trump administration–1,000 in September alone. This is wonderful news when you consider that every dollar spent by the federal government is a dollar taken out of the private sector. How many dollars does the lower federal payroll put back into the private sector? Since President Donald Trump took office, federal employment has declined by 16,000. In December 2016, the month before Trump’s inauguration, there were 2,810,000 people employed by the federal government, according to the BLS data. By August 2018, that had declined by 15,000 to 2,795,000. In September, it declined another 1,000 to 2,794,000. At the same time, overall government employment (including those employed by state and local governments) increased 13,000 in September and has climbed by 100,000 since December 2016. In December, 2016, there were 22,306,000 people employed in state, local and federal government combined. By August 2018, that had climbed to 22,393,000. In September, it jumped again to 22,406,000. It’s time to cut all government employment and get people back to work in the private sector. I realize that we need a certain number of people to run all levels of government, but I am totally convinced that the number of people could be greatly decreased without harm to government services at all levels. The Daily Signal is reporting today that the Trump administration has ended a government contract to buy fetal tissue from a research firm and will conduct an audit of any such research subsidized by federal taxpayers. The contract, first reported by CNS News, prompted 45 pro-life leaders to sign onto a letter to Secretary of Health and Human Services Alex Azar calling for an end to the government’s use of tissue from aborted babies for research. After a recent review of a contract between Advanced Bioscience Resources Inc. and the Food and Drug Administration to provide human fetal tissue to develop testing protocols, HHS was not sufficiently assured that the contract included the appropriate protections applicable to fetal tissue research or met all other procurement requirements. As a result, that contract has been terminated, and HHS is now conducting an audit of all acquisitions involving human fetal tissue to ensure conformity with procurement and human fetal tissue research laws and regulations. Advanced Bioscience Resources reportedly is among the entities under referral for a criminal investigation into whether they profited from the sale of tissue from aborted babies. Among the company’s sources for fetal tissue are Planned Parenthood-affiliated clinics. This will be a financial blow to Planned Parenthood. I don’t know how much of a financial blow, but Planned Parenthood profits off of the sale of aborted baby body parts. This will at least end public funding of research on aborted baby body parts. It is a step in the right direct. Next, we need to defund Planned Parenthood. No organization that accepts government money should be able to contribute to the campaigns of the people who allocate that money. Townhall posted an article today about the impact of green energy on the middle and lower class. Liberals love to talk about helping the poor and the middle class, and they are obsessed with reducing income inequality. So why is it that across the country they are pushing one of the most regressive taxes in modern times? I am talking about the fad “green” initiative in states such as California, Arizona and New Jersey that require local utilities to buy expensive renewable energy. These renewable energy standards require that utilities to buy expensive wind and solar power. They then pass these costs onto the poor and working class who get stuck paying the tab. In Sacramento, California, the legislature is speeding ahead with one of the most absurd proposals of modern times by mandating 100 percent renewable energy by 2045. This would mean no coal, no natural gas and no nuclear power. Meanwhile in Arizona, voters will decide on a ballot initiative funded by billionaire Tom Steyer that would increase renewable mandates to 50 percent over the next decade or so. Low-income households spend at least four to five times more out of their incomes in energy costs than do millionaires. For a family with an income of $40,000 or $50,000, an extra $500 a year in costs means less money for school supplies, day care, a family vacation or health insurance. All of this is so unnecessary. If wind and solar are truly the energy sources of the future — with reliability and low costs — let the market determine that. Why do they need mandates and billions of dollars of federal subsidies to make them work? This is an experiment of imposing high costs on American small businesses, farms and families to pay off wealthy green energy investors. Could anything be more illiberal than this? One of the benefits of the economic growth the Trump administration has created is the resurgence of the middle class–it is growing instead of shrinking (as it did under President Obama). The middle class is the strength of our republic–it is the only bulwark we have against the misguided proponents of socialism. When the middle class realizes the impact socialism will have on them, they oppose it. Unfortunately the students in our high schools and colleges are not getting that message. Using green energy as an excuse to increase the poverty levels is not a good idea. It is not a surprise that the people proposing the increase of green energy are the people least likely to be impacted by it. “When somebody says like the person you just mentioned who I’m not going to advertise for, that he’s going to bring all these jobs back. Well how exectly are you going to do that? What are you going to do? There’s uh-uh no answer to it. He just says. “I’m going to negotiate a better deal.” Well how? How exactly are you going to negotiate that? What magic wand do you have? And usually the answer is, he doesn’t have an answer. President Obama stated many times that the manufacturing jobs lost to Americans weren’t coming back. He is now faced with the problem that the policies of the Trump administration have brought many of those jobs back. He is also trying to take credit for the economic growth under President Trump. I am not sure how many people are willing to believe that. However, there is something that does need to be mentioned here. President Obama said that manufacturing jobs were not coming back to America. In a sense that was a true statement–if Hillary Clinton had become President, manufacturing jobs were not coming back to America. So what would a President Hillary Clinton have done differently that would have prevented those jobs from coming back to America? Let’s look at the things that determine where a corporation manufactures its product–a low cost of doing business–things like the cost of energy, taxes, wages, etc., economic stability–the idea that taxes will not substantially increase the year after relocation (another reason to make the tax cuts permanent as soon as possible), reasonable business regulations, a dependable, conscientious workforce, and infrastructure that provides a reliable way to move a product. Hillary Clinton would not have cut taxes, cut regulation or increased energy production to bring the price down. Hillary Clinton’s economic policies would not have attracted businesses to America. The economic growth we are seeing is the result of policy changes made since President Trump took office. In November, Americans have to make a choice. Do they want our current economic growth to continue or do they want to go back to President Obama’s economy? A vote for a Republican is a vote for the Trump economy, a vote for a Democrat is a vote for the Obama economy. We have a choice. As we approach the mid-term election, there are a number of things to consider. One of the things to look at is the Right-Direction or Wrong Track poll done by Rasmussen. Right now 43 percent of Americans think we are headed in the right direction; 52 percent think we are headed in the wrong direction. In contrast, on October 30, 2016, 30 percent of Americans thought we were headed in the right direction, and 63 percent thought we were headed in the wrong direction. In early January 2016, 28 percent of Americans thought we were headed in the right direction, and 67 percent thought we were headed in the wrong direction. So where am I going with this? As Bill Clinton said, “It’s the economy, stupid!” Hopefully most Americans understand that if the Democrats are able to take control of Congress this year, the economic progress made by the Trump administration will end. Impeachment proceedings against President Trump will begin (it won’t matter whether or not there are any valid charges, the trial will begin). Any investigations into Uranium One, spying on political opponents, or politicizing the justice system will also end. That will mean the institution of a two-tiered justice system in America. If you are connected to the right people, you can pretty much get away with anything. That is what a Democrat victory in the mid-terms will bring us. The Democrats fear that the public will begin to realize this and will attempt to shut down conservative news. I say all that to predict the actions of the political left in the coming two months. The American Thinker posted an article today spotlighting a situation that should concern all of us. It is about the censorship of Alex Jones. I need to say up front that I am not a huge fan of Alex Jones, but whether you like him or not is not the point. The fact that he can be banned from certain areas of the Internet because of his views should give us all pause. As we approach the mid-term elections, I expect to see more of this. A lot of it is already happening. Please follow the link above to read the entire article. It reminds us of some of the abuses by the media that we have seen in recent years. The Internet has ended the liberal monopoly of the media– it was wounded with the advent of popular talk shows, but the Internet allows everyone to do their own research. Expect to have to look a little harder for your favorite conservative news source in the next few months. I believe PragerU is back on Facebook, but I am not sure for how long. That is only the tip of the iceberg. On August 14th, Investor’s Business Daily posted an article about the impact that the removing of regulations by the Trump administration has had. As the Competitive Enterprise Institute noted earlier this year in its “Ten Thousand Commandments” annual report, federal regulations cost a lot more than their stated dollar amount. As of last year, regulation and federal intervention in the economy cost Americans an estimated $1.9 trillion. And that’s one of the lowball estimates out there. How much is that? It’s the equivalent of a $15,000-per-household tax levied each year in perpetuity. That’s more than the average family spends on food, clothing or transportation. Only housing takes more of the family budget. If regulation were a nation, and let’s be thankful it’s not, it would be the eighth-largest economy in the world. Regulation even exceeds the IRS’ total take in corporate and individual income tax. That’s how big it is. Last year, Trump began cutting rules in earnest as soon as he entered office. He slashed the total number of pages in the Federal Register, the government’s regulatory bible, from 95,894 in 2016 to 61,308 pages in 2017. That’s a decline of 36% and the lowest since 1993. This year it will go even lower. On Friday, Investor’s Business Daily posted an editorial about how removing some regulations has impacted ObamaCare. The leftist Center for American Progress claimed that premiums for ObamaCare’s “benchmark plan” would rocket up 25% next year, due almost entirely to the individual mandate repeal and Trump’s decision to expand access to far less expensive “short term” insurance plans that don’t have to comply with ObamaCare regulations and mandates. Rates in Pennsylvania, it said, would jump 27%. They were going to climb 28% in Wisconsin. And 29% in Arizona and Nebraska. All those dire predictions scored widespread news coverage. But then insurance companies started announcing modest rate requests for 2019, and suddenly ObamaCare was no longer a story. ObamaCare premiums will rise a mere 0.7% in Pennsylvania, according to the state’s insurance commissioner. They will climb by just 1% in Nebraska. In Wisconsin, they’re expected to drop by 3.5%, and drop by more than 5% in Arizona. The overall increase this year will be just over 5%, on average, according to ACASignups.net, which is aggressively supportive of ObamaCare. If that holds true, it will be the lowest increase in premiums since ObamaCare started. According to data from the Health and Human Services department, premiums in the individual market jumped 25% in 2014, ObamaCare’s first year. They climbed 14% in 2015 and 8% in 2016. In 2017, premiums shot up by 23%. And then another 37% in 2018. Keep in mind that except for the 2018 rate increase, all those prior hikes were announced when Barack Obama was in the White House and everyone expected Hillary Clinton to become the next president. Government regulations affect all of us. Most of them simply need to go away. The Washington Examiner posted an article today about changes made to the current federal regulations regarding healthcare insurance. Last Wednesday, Health and Human Services Secretary Alex Azar announced a finalized rule granting consumers greater access to affordable health insurance policies. Under the new rule, people will be allowed to purchase short-term, limited-duration health insurance plans for periods as long as 12 months. Currently, the maximum period allowed is only three months. Plans can be renewed after the 12-month period, but they cannot extend beyond 36 months. Short-term health insurance plans are significantly cheaper than most Obamacare plans because they don’t include many of the costly essential health benefits mandated under federal law and because they are sold for a limited duration. These plans do not provide comprehensive coverage, but they are an excellent option for people who are relatively healthy but can’t afford to pay for an outrageously priced Obamacare plan. This means that a family whose insured member is changing jobs or between jobs can get coverage at a reasonable price. The plans cannot extend for more than three years, but hopefully Congress will find its backbone and totally repeal ObamaCare by then. Premiums are not the most important cost to consider, however, because some people who purchase health plans through an Obamacare exchange receive large subsidies to help offset their plan’s high premiums. A much more important factor is the high cost of deductibles and other out-of-pocket costs. The average family enrolled in a Silver Plan will pay a maximum of $13,725 for out-of-pocket expenses, with Silver Plan deductibles increasing by 13 percent in just the past year alone. Working families can’t afford to pay more than $13,000 to cover out-of-pocket expenses. In fact, health insurance this expensive is virtually useless. The high costs associated with an Obamacare plan are a big reason why the Centers for Medicare and Medicaid Services predicts about 600,000 Americans will sign up for a new short-term health insurance plan next year. By 2022, CMS expects 1.6 million to be enrolled in a short-term plan. The healthcare system is failing, and has been for decades. Despite the promises made by former President Barack Obama and the congressional Democrats who passed Obamacare into law, the legislation has only made things worse. Congress needs to pass a bill to repeal and replace Obamacare. But since that has yet to occur, the Trump administration is doing everything it can to help young people and working families gain affordable coverage. It’s great to finally have a presidential administration that’s truly committed to reducing health insurance costs rather than appeasing far-left activists in the Democratic Party. Yesterday The Washington Times posted an article about the Trump administration’s decision regarding CAFE (Corporate Average Fuel Economy) standards. The administration is freezing current gas mileage requirements rather than instituting the drastic standards put in place just before President Obama left office. Regulators required that automakers achieve an average 54.5 mpg by 2025, but they relaxed that target to between 50.8 mpg and 52.6 mpg last year. The argument against the draconian standards was that they would increase the price of a car by almost $2000 and create unemployment in the auto industry. The harsh standards would also make our roads less safe. A draft of a regulation prepared this summer would freeze an Obama-era program that was intended to improve fuel efficiency and cut pollution. In excerpts obtained by The Associated Press, the administration argues that heavier vehicles are safer than lighter ones and that people would drive more — and be exposed to increased risk — if their cars get better mileage. Until we can come up with a material to make cars that is light, strong, and inexpensive, heavier vehicles are safer. American roads have many semi-trailers and trucks on them. A lightweight vehicle does not have a chance of survival in a crash with a heavier vehicle. Fuel economy is a good thing, but the safety of Americans is also very important. The Daily Signal posted an article today about another battle in the war on the involuntary taking of union dues. Sally Coomer of Seattle, who cares for her disabled adult daughter at home, doesn’t like the fact that union dues are deducted from the Medicaid payment she gets for her services under a Washington state policy. “The money that is taken out in union dues, if it was not siphoned off, could be used to provide for more care,” Coomer told The Daily Signal about the Medicaid stipend given to home care providers. “A lot of family members forgo careers to take care of family members and are working in situations where they are really financially struggling,” she said. Washington is one of 11 states where the state governments work with public-sector unions to automatically deduct a portion of the Medicaid stipend and divert it to unions representing state employee unions. The other states are California, Connecticut, Illinois, Maryland, Massachusetts, Minnesota, Missouri, New Jersey, Oregon, and Vermont, according to the State Policy Network, a conservative think tank that focuses on state issues. Nine states take money from Medicaid home child care workers: Connecticut, Illinois, Maryland, Massachusetts, New Jersey, New York, Oregon, Rhode Island, and Washington. Taking care of your child at home should not result in having union dues taken out of money you receive for the care of that child. However, the states face pushback from the Trump administration and, potentially, the courts in light of a recent Supreme Court ruling striking down mandatory payments to public employee unions by employees who don’t belong to the union. The rule proposed by the Centers for Medicare & Medicaid Services would eliminate states’ ability to divert part of Medicaid payments from providers to a third party. Caregivers may pay up to $1,000 per year in union dues, according to the State Policy Network, which says state governments are “dues-skimming” an estimated $200 million per year from home health providers and $50 million from child day care providers to give to unions. Coomer’s daughter Becky, almost 28, has cerebral palsy and a disorder that causes seizures. She is blind and developmentally disabled. Coomer, who has become an advocate for other families who don’t want to be forced to pay union dues, said many home care providers are not aware they have a choice in joining a union. To qualify in Washington state, family members are required to go to an orientation run by the Service Employees International Union, which represents state government employees. The proposed new Medicaid regulation, announced July 10, is open for public comment. Let’s hope that the practice of taking union dues from people caring for family members is ended quickly.